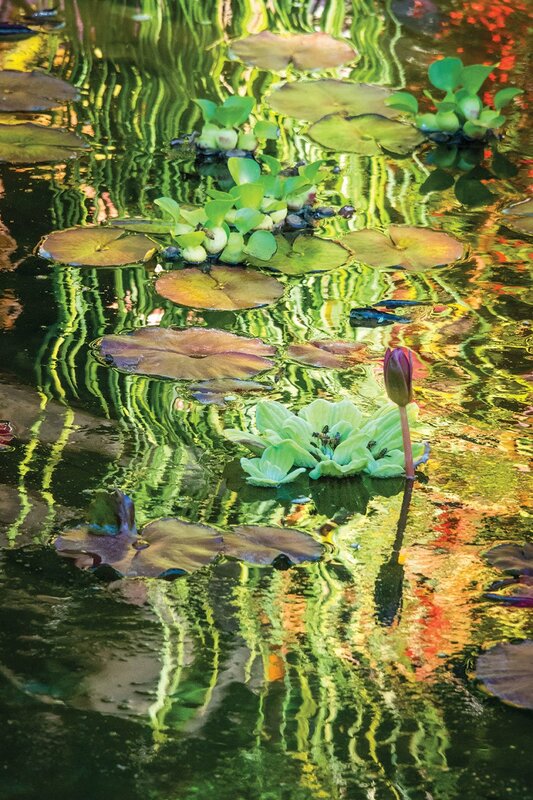 Purple- and pink-flowered water lilies in a shimmering backyard pond. John Beaudry’s earliest memories often swirl around childhood visits to his neighbor’s garden—a “magical place…full of intrigue” where the Midwest’s dramatic seasons brought renewal in spring, glory in summer and retreat in fall and winter. 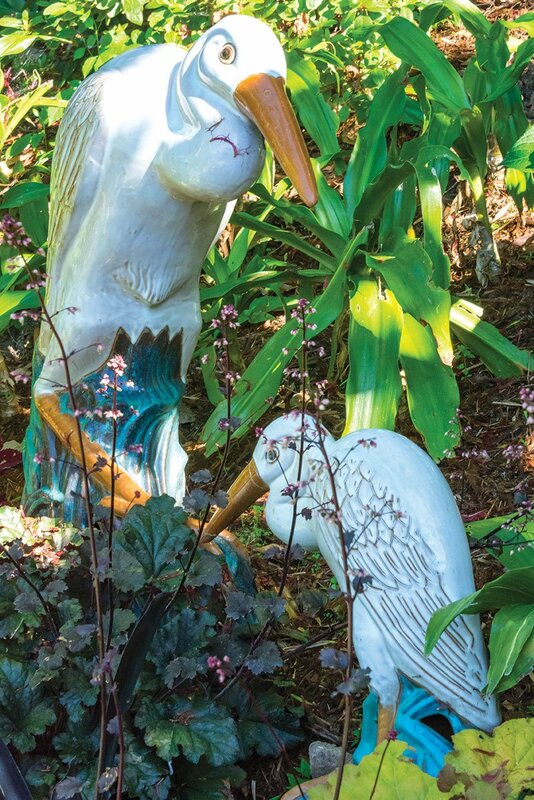 Crane statues nestle among shade-loving crinums and “Plum Pudding” coral bells in John’s sanctuary, the meditation garden. After four years in rentals, the couple worked quickly at their newly purchased home to remove lawn, diseased trees and most of the “industrial” concrete-block wall edging the backyard’s steep slope. A majestic evergreen ash and mature orange, guava, persimmon and pear trees stayed, anchors for the sheltering canopy John envisioned there. 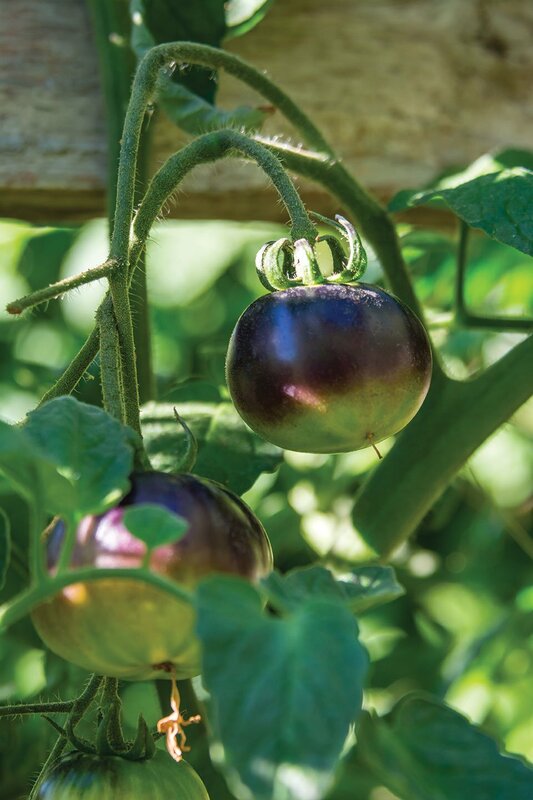 Today, trees, shrubs, vines and edibles intermingle freely in the lush “food forest” that provides fruits, veggies and herbs for family meals; cooling shade when temperatures soar; and a habitat for beneficial insects, birds and other wildlife. In this edible landscape, melon vines cavort among flowering perennials, monarch butterflies feast on milkweed, and sweet mint skirts a citrus grove and 6-foot-tall tomato plants growing in straw bales. “This garden is so alive,” John observes happily. 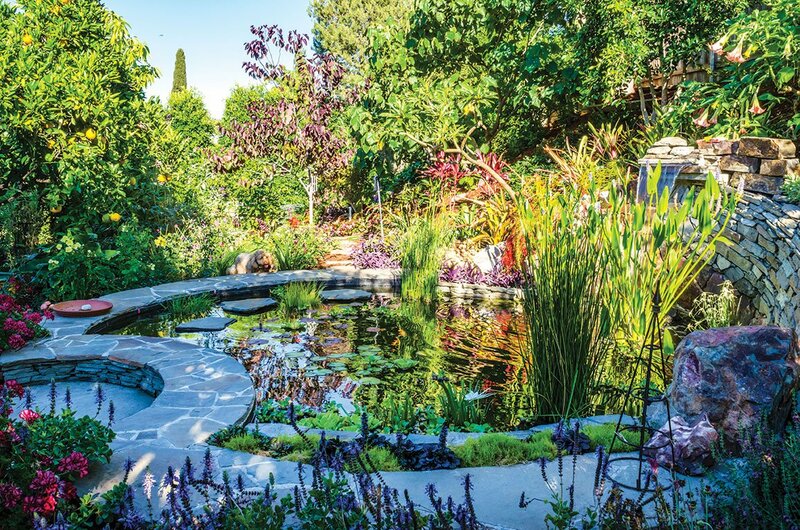 Also in the mix are soothing water features, sheltered patios, Japanese maple and orchid collections and plants gleaned from former gardens, friends and job sites. One aged yellow rose, moved several times, blooms above arm-thick canes. Another survivor, a Meyer lemon, was rescued from discards at the Chicago Botanic Garden when John was a senior horticulturist there. Bearded irises along a grassy path were gifts from a fellow plant lover. One of the garden’s overlapping circular rooms is John’s sanctuary, a quiet patio secluded by a ficus hedge, whispering black bamboo and a colorful border scented by a slender champaca, the tree that’s the source of flowers for the legendary fragrance, Joy, created for Parisian couturier Jean Patou in 1929. John meditates here daily, watched over by a tall statue of Quan Yin, the Buddhist goddess of mercy. Three crouching cranes, with small hanging bells that sound softly, randomly, in the breeze, nestle nearby among a couple of Martin’s favorite Japanese maples. 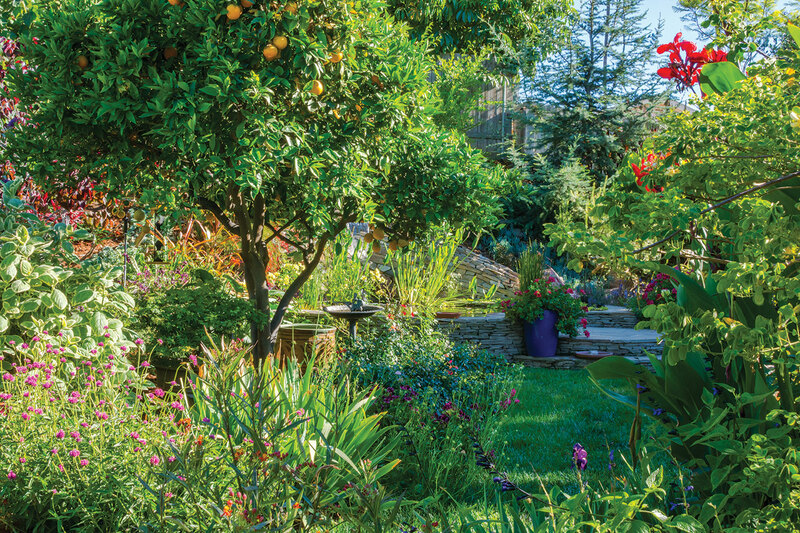 A Valencia orange tree punctuates a colorful perennial border. Among the flowers in the mix of ornamental and edible plants are red cannas and purple globe amaranth. Seating here also embraces views to the slope and the garden’s focal point—a large round pond fed by a waterfall spilling down a triangular bluestone wall bisected with bold Baja Cresta rock. 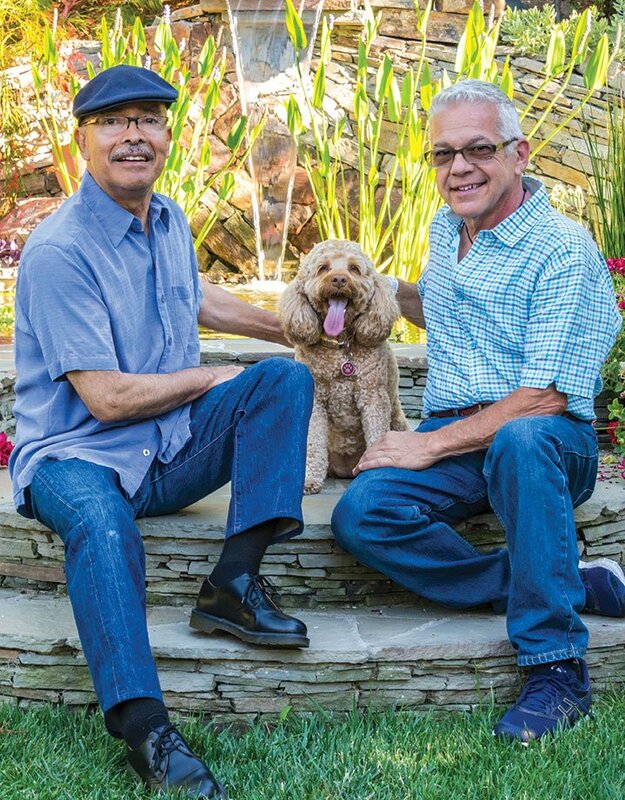 More bluestone edges the rippling water—a magnet for the couple’s Australian labradoodle Lila—and shapes the pond’s access steps, a circular design inspired by the legendary Arts and Crafts-era English architect Edward Lutyens. 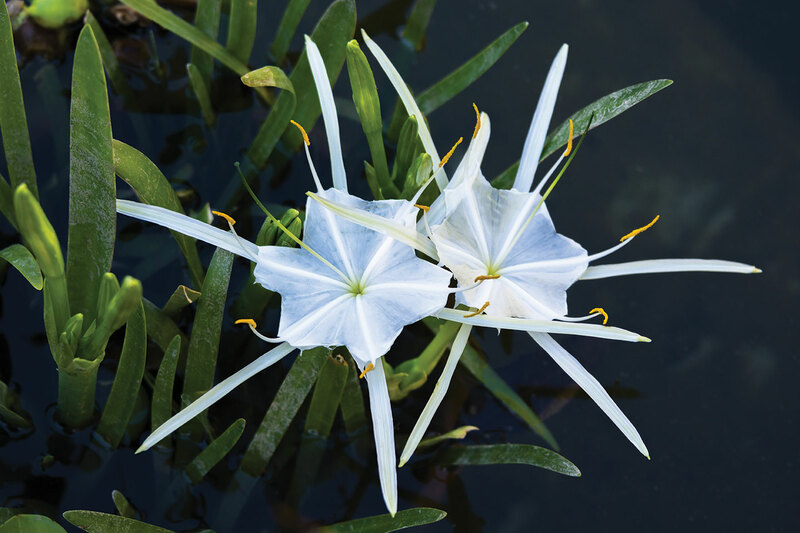 On the slope above flourishes an eclectic mix of plants, ranging from fragrant plumeria and angel’s trumpet to stiff bromeliads in vases and a languid silver-blue deodar cedar. Nearby, a tall drift of ‘Tropicanna’ cannas with hot-orange flowers and multicolor striped leaves glows when backlit by the setting sun. “I love to design to take advantage of situations like this,” John says. In the shade at the yard’s west end, John tends compost piles, nurtures more Japanese maples and houses a potted cymbidium orchid collection beneath a handsome pineapple guava tree. When their flower spikes rise in midwinter, he moves them closer to the house to enjoy their long-lasting white, pink and yellow blooms. This fall, while promoting his just-published book, Garden Sanctuary, John continues a makeover of the front yard. Part of the backyard will get a facelift too when the trio remodels the kitchen to bring the outside in via new French doors.